The highest wicket-taker in Test cricket: Today we are going to tell you about the highest wicket-taker in Test cricket. If you are a cricket lover then you will also want to know about the famous bowler of the Test match. Before this, let us tell you that the contribution of the batsmen to the cricket match as well as the contribution of the bowlers also happens. If there is a good bowler in any team then it is very difficult to beat the team. Talk about cricket's oldest format test, it is very important to take wickets of the bowlers in it. Although many people like batsmen there is no shortage of bowlers' lovers. Many people want to know who is the player who has taken the most wickets in the Test match. Test matches are being played since the birth of cricket, although at present, two new format ODIs and T20s have been added in cricket, which is being widely liked many people consider the test to be real cricket. Because in this format, there is a passion for the batsmen to take wickets and bowlers' wickets. By the way, tell your information that the highest run in the Test is made by Sachin Tendulkar. Sachin has played a total of 200 matches in his Test career, during which he has scored 15921 runs in 329 innings. Sachin played his first Test match in 1989 and the last Test year 2013. Sri Lankan bowler Muttiah Muralitharan is the first place in this list. He started his Test career in 1992 and played in the last Test in 2010. During this period, he has played 133 matches and has taken 800 wickets in 230 innings. His best performance is 9 wickets taking 51 wickets. Muralidaran has done 22 times in a match to take 10 wickets. Australia's former bowler Shane Warne in second place Shane Warne also started his Test career in 1992. He played the last Test match in 2007. He has played a total of 145 matches in his career, taking 708 wickets in 273 innings. He has done 10 times in 10 Test matches in a Test career. Shane Warne's best performance is taking 8 wickets with 71 runs. 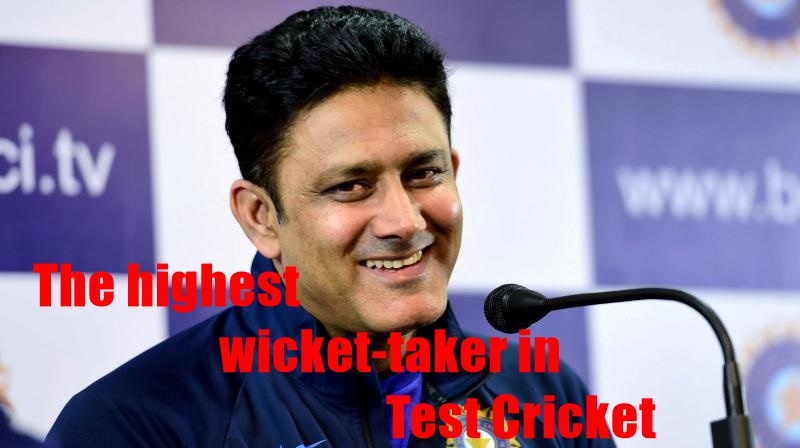 Third place is former India bowler Anil Kumble who has also become the coach of Team India. He started his Test career in the year 1990 when the last test match was played in 2008. Anil Kumble has played 132 matches in his career, having taken 619 wickets in 236 innings. His best performance is taking 10 wickets with 10 wickets. At the same time, we have done 8 times to take 10 wickets in a match. 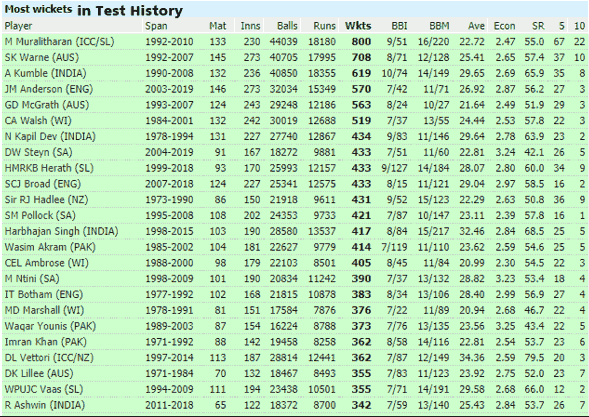 So now you have learned about the highest wicket-taker in Test cricket, here we have given you the list of the top 20 on the image in which you can see all the records related to bowling. Well tell you, former India bowler Anil Kumble is the only bowler who has taken 10 wickets in an innings.